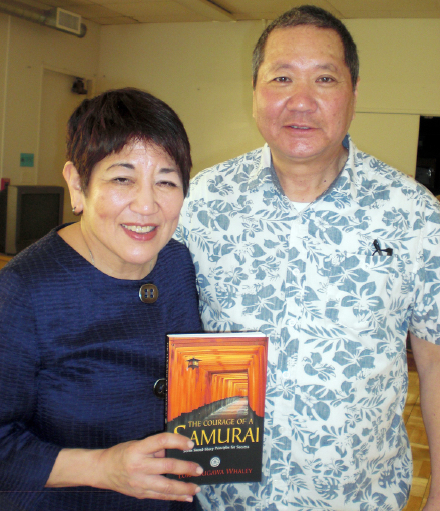 Pacific Northwest-based author Lori Tsugawa Whaley visited Southern California to give talks on Chiune Sugihara and bushido (the way of the warrior) on Feb. 9 at the Gardena Valley Japanese Cultural Institute and Feb. 10 at Union Church of Los Angeles. Whaley, a Sansei, wrote “The Courage of a Samurai,” which is being reissued this year by Tuttle Publishing as “Seven Samurai Secrets of Success.” She uses the stories of notable Japanese and Japanese Americans to illustrate such principles as courage (yuuki), respect (rei), honesty (makoto), and loyalty (chuugi). She was invited by Mitchell Matsumura of Sansei Legacy, who has been presenting a series of programs in Gardena and Los Angeles, including documentary film screenings and panel discussions. Sugihara, a diplomat stationed in Lithuania with his wife and children during World War II, is known as “the Japanese Schindler” because he saved thousands of Polish Jews from the Holocaust by issuing transit visas that allowed them to leave the country before the arrival of the Nazis. He did so against the orders of the Foreign Ministry in Tokyo, and it is believed that he lost his job after the war because of this incident. “So his life just really encouraged me to write this. And the more I thought about him, the more I studied about him … Sugihara was a samurai warrior, yet he did not handle a gun or sword. He brought about change without going to battle. He was strategic yet peaceful, decisive yet compassionate, and determined yet gentle. He was a peaceful warrior. And not every warrior has to be a battlefield-hardened soldier to be a true warrior and hero. Not long before his death in 1986, Sugihara was honored by Yad Vashem, Israel’s official memorial to victims of the Holocaust. His wife Yukiko carried on his legacy until her passing in 2008, as did their four sons. Only one son, Nobuki, is still alive. Members of North High School Torrance American Red Cross Club volunteered at the GVJCI event. The club’s president is Mika Matsumura (standing, third from right), Mitchell Matsumura’s daughter. The 522nd Field Artillery Battalion, part of the 442nd, liberated the Dachau death camp, and this is where the Nisei soldier story intersects with that of Solly Ganor, Whaley said. “Because they [Ganor’s family] were Russian, they were unable to obtain one of the Sugihara transit visas, so the family was taken to Dachau, and we all know what happened there. Many were beaten, starved, annihilated. But Solly happened to live through that. Decades later, Ganor and other survivors were reunited with Matsumura and other 522nd veterans, Whaley said. “Over 40 years later … all they could do was cry. And he said his psychiatrist or a psychologist told him that he was like an emotional amputee, a psychological amputee, because he had seen so much horror, so much death and human brutality that … he couldn’t talk about it. But it wasn’t until he was reunited with the men of the 522nd … embrace and hug and have a joyous reunion, that he was able to finally cry and talk about it. In 2017 in Seattle, Whaley participated in a three-part program, “The Holocaust and Japanese American Connections,” initiated by 442nd veteran Tosh Okamoto. She facilitated a talk about Sugihara while historian Eric Saul discussed the 522nd and the liberation of Dachau. 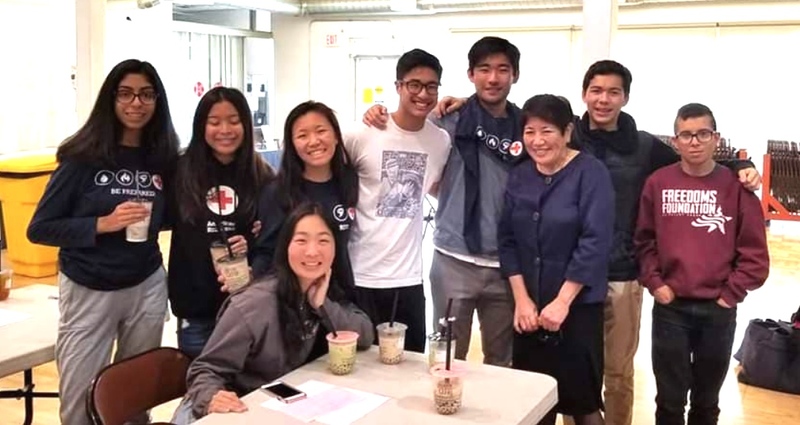 Partners included Seattle’s Holocaust Center for Humanity, the Nisei Veterans Committee, the University of Washington Department of American Ethnic Studies, and the Consulate General of Japan in Seattle. “It was a wonderful event and brought more people knowledge about what happened … and brought people together, bridging that gap, because with the Japanese and the Jews, there’s that connection,” Whaley said. Others profiled in the book include “Years of Infamy” author Michi Nishiura Weglyn, Sen. Daniel Inouye of Hawaii, Merrill’s Marauders veteran Roy Matsumoto, and the author’s mother, Mable Tsugawa.